Babolat Drive Max 110 Tennis Racquet has been in the market since 2013. Many tennis players have loved it due to its sheer ability to provide maximum power and spin. Since then several new high-powered rackets have been launched from Babolat, HEAD and Wilson. My question is that is it still worth getting your hands on Babolat Drive Max? Does it really provide the same power and spin today and is it sensible to buy in 2018? We will look for the answers to these questions in this in-depth review. So, without further delay let’s move on. What is My Experience Handling Babolat Drive Max 110 Racquet for Last 3 Months? Who are the Best Benefactors? Babolat Drive Max 110 came after Drive Max 105. The weight for both of these rackets is same at 9.2 ounces. The unstrung weight of this racket is 9.2 ounces and strung weight is about 9.8 ounces. So, I can say it is comparatively a lightweight racquet as compared to the other Babolat power rackets. The category for this racket can be considered as a middle weight racquet and its best for all advanced to intermediate tennis players. This related lightness of the racket provides you a better opportunity to swing substantially for every tennis stroke you play. Here and there you may be able to make some awesome shots with the help of this Drive Max 110 racket. So, the 2 major benefits you get from this racket is easy handling and faster shots due to its lightness. As already mentioned in the features section above, the head size of this racquet is 110 sq. inches. This is definitely a large head size in comparison with the other existing smaller headsize rackets that are available from 95 sq. inches. Due to this medium large head size, one good thing you get is a large enough sweet spot. The sweet spot you get with this racket is much higher as compared to the 95 and 100 sq. inches head size rackets. Due to this, you are able to obtain good energy transfer and the tennis ball often lands on the racket more easily. If you are a tennis player who is looking for a racquet that can offer more powerful forehand and backhand shots, then this Babolat racket is perfect for you. Even I find that I had to adjust some of my shots to prevent hitting the tennis ball out of the court lines. The graphite construction of this racket has added it more reliability and power as well. You will feel the improved power in your every shot when you play with this racket. I really felt that this racket is easier on my arms and it is easier for volleying also. The control you get on your shots while playing with this racquet is also worth mentioning here. Yes, basically the Drive Max 110 comes under slow to moderate swinging type racket. If you have been using low power beginner level rackets, then you will experience higher swinging ability with this racket. When in my hands, I felt it really lightweight but when I played shots with this racket, I felt that the swing you get is medium level and not that great as compared to more premium level high power Babolat rackets. The swing weight of this racquet is considered to be 302 to 311. Therefore, your wrists will not feel much pressure when swinging this racket for every stroke on the court. If you are not much aware about how to measure the balance point of your tennis racquet, then I recommend you to watch the following video to understand how to do it. So, if you have watched this video carefully, then you might have understood by now that this racket is a bit heavier on the head size. And it is a good news for those tennis players who want more power shots. Because a heavy head weight gives you more power and control while serving your strokes on the court. The total length of this racket is 27.5 inches and the balance point comes at about 13.75 inches in the middle. Most high powered racquets are built this way to gain more power for every shot. This racket when it is unstrung gives you balance point at 350 mm or 13.78 inches. This amount of balance point is more suitable for old or senior tennis players who want more power at less swing. The grip type as mentioned in the features section above, is made from Syntec Soft material. This grip is built with Babolat’s trademark Cortex Comfort Technology. This feature offers more comfort and better support when you hold this racket in your hand. I felt less vibrations when playing with this racket which I think is possible because of this CCT feature. There are basically two types of sizes available for this racket. One is ¼ and second is 3/8. Both of these grip sizes provide superior comfort and better hold even when your hands are sweaty. Babolat Drive Max 110 comes with 16 x 20 string pattern. This gives much better spin capability for a tennis player. This pattern also provides you better control and comfort while serving your strokes. However, I noticed that the strings that have come with this racket when I ordered were made from cheap nylon material. Therefore, I restrung it with 18 guage multifilament to make it more durable and comfortable to play. This 16 mains / 20 crosses string pattern gave me much better serving experience on the court. I also found that when you are able to swing the ball properly, you get better spin with this racquet. Even most slice and kick serves will get you better spin if you swing the ball perfectly. Babolat has included their famous trademark technology called as CCT (Cortex Comfort Technology) in this racquet. This is the feature which is important for any tennis player. Because it has an active vibration filtering system in-built into the racket construction. The interface between the frame and the handle of this racket helps us to feel the ball more efficiently. Due to this feature, I think unwanted high frequencies are filtered out and necessary low frequency sensations are preserved which is damn useful feature for us. This racket is also built with Elliptic Geometry construction technology. This feature helps to prevent too much twisting of the racket. In a way, it enhances the overall power of the racquet. I feel that the twist resistance of this racket is great and that’s why I got better power while serving the shots. In fact, this type of design is 20 percent more stiffer than your traditional racquet frames. This is the reason the shaft of Drive Max 110 is somewhat more tough and less prone to bending when you hit the ball with it. So, less twisting and strong racquet frame are the two things which is possible due to elliptic geometry of this racket. My Personal Rating for Babolat Drive Max 110 Tennis Racquet after handling it since last 3 months. This Babolat Drive Max 110 Racquet is made to get high powered, high swing tennis strokes. It has a little high weight and it is not suitable for junior level players. The grip you get with this racket is exceptional. Swing Weight and Balance Point both are perfect for high power racquets. But the string quality needs to be improved. It is made from cheap nylon material. You need to restrung it with better quality material. Considering all these facts, I will recommend this racquet for all intermediate and advanced professional tennis players. Even some senior and old folks can be benefited from this racket as it requires less energy to hit high power shots on the court. And You need no extra strength to swing your racket due to its elliptic geometry design. So, all in all my final rating for Babolat Drive Max 110 is 4 out of 5 and I fully recommend it for advanced as well as intermediate players with rating more than 3.5. 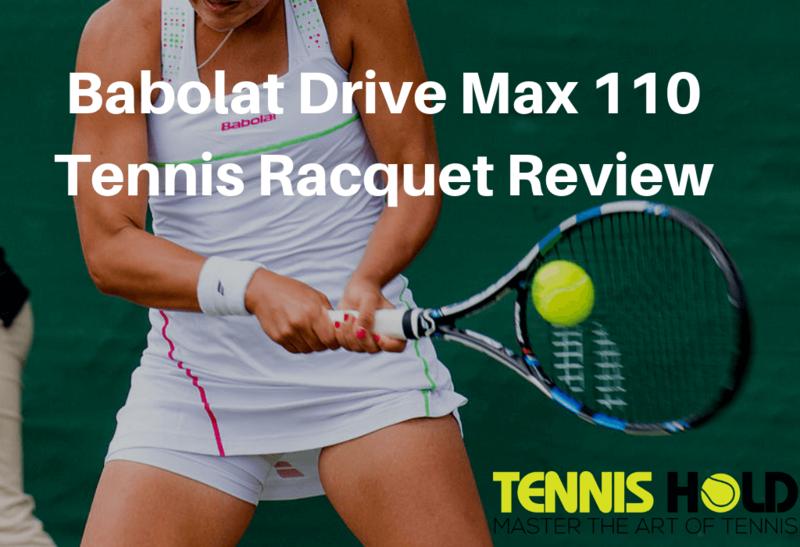 Click Here for Discounted Price and See More Reviews of Babolat Drive Max 110 Racquet.